Brian Barjenbruch, meteorologist with the National Weather Service in Topeka, instructs residents on what to look for in storms to spot potential severe weather. 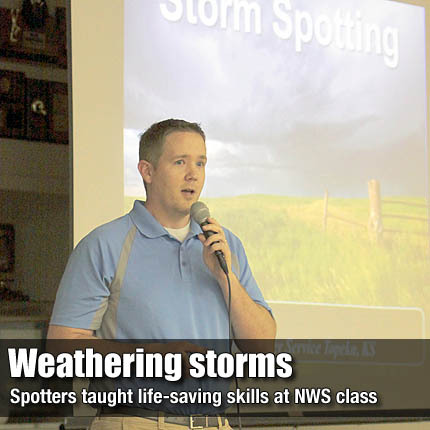 OSAGE CITY—More than a hundred area residents received a crash course in protecting their families and neighbors at Storm Spotter Training class offered by the National Weather Service (NWS) in Topeka March 15 in the Osage City High School cafeteria. “Believe it or not, the information you provide can help save a life,” said NWS meteorologist Brian Barjenbruch, who conducted last week’s meeting. Barjenbruch led off the meeting with instructions on being safe in a structure from a tornado. He reminded people to plan ahead for where they would go in the event of a severe storm, and to prepare themselves with several means of receiving a warning. Options included mobile phones, radios, weather radios, TV, social media and other forms of communication. “The best weather information is worthless if it’s not received,” Barjenbruch said. Barjenbruch also suggested storing any helmets within pre-planed safe areas, noting a Joplin man whose life was saved by a motorcycle helmet when his house collapsed around him.